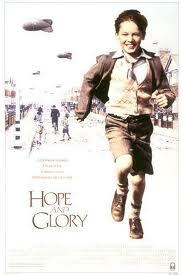 Hope and Glory is such a lyrical and beautiful movie. A rare gift of total enchantment. Like a perfect summer day. Bill is only 9-year-old at the beginning of WWII. He is the only boy in a house full of women as his father has joined the forces. For him and his little sister the war is a great adventure. They don´t really understand the dangers. Bill collects shrapnel and plays with other boys in the ruins of the houses in his street in a suburb of London. At night they run for cover from the constant bombing. When their house burns down, his mother takes them to the country where her parents own a splendid stately home on a lake. The children enjoy idyllic summer holidays. They go fishing with their grumpy grandfather or play cricket. Their mother´s sisters join them, as do other family members. At the end of summer the war holds a special surprise for them. Their school has been bombed. It is easy to understand what joy this bears. Hope and Glory is also a look back at a lost world where families were much closer, where life, despite the hardships and the war seemed somehow better than today. And of course it does remind us of our own childhood that often with hindsight seems like a lost paradise with little daily worries. Still the depiction of the war is very realistic. For us with our grown-up´s eyes there is no mistaking it for a joyride. This entry was posted in Children and War, Europe, Movie, Reviews, War Movie, WWII and tagged Children and War, Family, Hope and Glory, Movies, Reviews, War Movies, WWII. A treat I caught was a Waltons episode where the family brings in 2 children to take care of from bombed out London. You might enjoy it if you ever come across it. Episode 11: THE CHILDREN’S CAROL (two hour episode) (5 Dec 1977) “I remember that Christmas when all the sounds and events of the world spoke against the holiday. London was being bombed, the evil of Nazi rule was spreading across Europe, and on Waltons Mountain indian summer held off the snows of winter. It was a year two young English children were to seek refuge on the mountain, and it was a year when my mother’s faith was put to its severest test”. I believe the long running show may have lost some steam in it’s last years but this episode is excellent. A bit on this same theme. Well thank you so much for sharing this link and pointing this out. It´s been a while since I last watched the Waltons but might try and watch this. 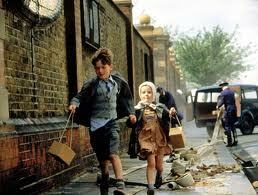 Hope and Glory is quite a remarkable movie. A very unique way of looking at war without belittling the horrors. I know I have seen the poster for this movie. I always thought in the past, I had seen this movie, but the movie I am thinking about is one where this little boy, I believe English is in some Japanese concentration camp in the Far East. So, it must be winter in Australia, I read more in the winter. The last few winters, I’ve read some of the Sgt. Rock and Unknown soldier book of archived comics. They are relatively okay. Haunted Tank was good until the stories became repetitive. I know there were other comic companies, less well known. I just bring that up because it seems war comics are a tiny bit like war movies. Empire of the Sun, with Christian Bale, is probably what you mean. It’s on my pile as well. Quite long though. Guess I never read a war comic but I read a lot. Maybe have a look one day. My husband was watching “Hope And Glory” on TV today while I was cooking supper. I couldn’t see the screen from the kitchen, but I could hear the dialog, and he described the action for me. (I could tell he was loving the picture; that’s rare, because he’s not much into movies these days.) And I did get to see the ending, when little Bill went reluctantly to school, only to find that it had been bombed and there would be no classes! The best summer of his life, said the voice-over narration. The funny thing is that we tuned in after the opening titles, and there was no reference to the name of the film on the cable “broadcast channel” where we were watching. We didn’t see the name in the end credits either, but they listed the year it was released. So I did a search on: “english movie 1987 wwii children country” — and it popped right up! That’s one of my favorite things about the internet. Anyway, thanks for listing the film in your blog. It was a real treat to (almost) watch. Hi Guinnevere, thanks for your comment. I really liked this movie a great deal. You should watch all of it some day. It’s one of the best focussing on children during the war. Not too harrowing but still serious enough. Another one you might like (if you haven’t seen it) is Goodnight, Mr Tom. A British TV production. I agree, there are a lot of great things about the internet.